The Massachusetts Bay Disposal Site in deep water off the coast has been used for ocean dumping, to dispose of munitions, dredged material, rock and construction debris and sunken vessels. Between 1919 and 1970 chemical warfare munitions were dumped, and after World War II hundreds of thousands of tons of surplus artillery and munitions, which are the majority of munitions washed up on shore. Most of them are inert UXO but occasionally they are live. Fishermen have brought a torpedo into Provincetown, Massachusetts, a depth charge into Gloucester, Massachusetts and mustard munitions into New Bedford, Massachusetts. Massachusetts Bay gave its name to the Massachusetts Bay Colony, which is one of the two predecessor colonies of the current state of Massachusetts. 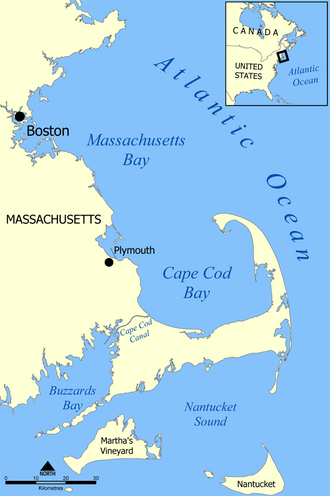 Massachusetts Bay is one of five bays besides Quincy Bay, Narragansett Bay, Buzzards Bay, and Cape Cod Bay that give the state the nickname "the Bay State". This article incorporates text from a publication now in the public domain: "Massachusetts Bay". Encyclopedia Americana. (1920). Massachusetts Bay Facts for Kids. Kiddle Encyclopedia.